OneDrive vs Dropbox – which of them will win the title of best cloud storage service? In this article, we are going to throw into the ring two heavyweight champs: Dropbox and OneDrive, formerly known as SkyDrive, and compare them in terms of security, plans, pricing, and storage features. Both of them are considered good cloud-based services, with great offers and good perks. But the question that remains is which of them will win the Dropbox vs OneDrive battle? If you ever feel the need to keep it simple, Dropbox is out there to help you. Dropbox started as an idea born out of necessity. Since the whole gig revolves around ease of use, this service is specifically designed to offer you maximum results with little to no effort. With Dropbox, you can store, share, sync and review your favorite files from any PC or device. Dropbox is mainly designed for individual users who want to exchange data free of charge. However, due to its outstanding features (efficient syncing, large file sharing, automatic backups to name just a few), Dropbox is successfully used by lots of businesses around the world. To start using the application, all you have to do is to create an account, sign in, invite people to join you by sending invitations, and start uploading. Dropbox’s nifty Windows tool allows you to share and access all files and folders directly from Windows Explorer. Moreover, if Explorer is not your cup of tea, then you can always head on over to Dropbox’s official website and access your files from the browser application. For example, every time you’ll want to open a document in Word, Excel, PowerPoint or Publisher, a Dropbox-like icon will appear in the right corner of the screen. That’s Dropbox’s latest weapon, which goes by the name of Collaboration Tool. 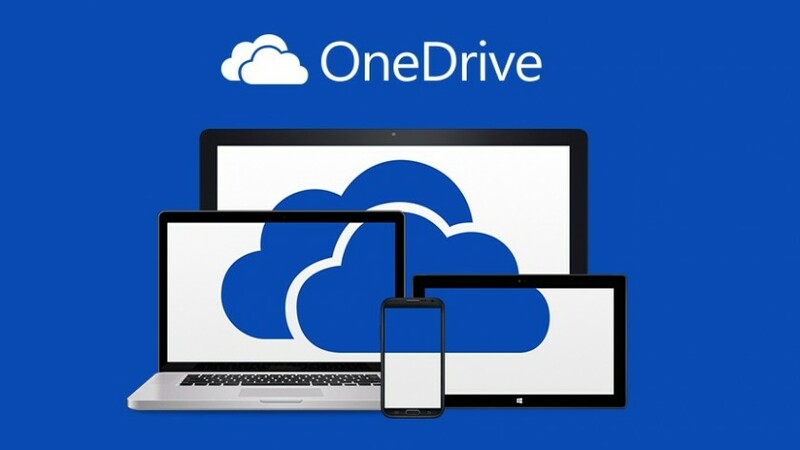 OneDrive, formerly known as SkyDrive, is Microsoft’s response to the whole cloud storage technology race. Although it took OneDrive a while to bounce back, the service is back on track, stronger and more powerful than ever. An important component of Office 365, OneDrive is aimed at businesses and individual users, offering a secure cloud-based hub where users can store, sync and update their files. If we were to describe OneDrive in one word, it would be integration. Customers who are currently working with Windows 8, Windows 10 or Windows Phone may have noticed the odd cloud-shaped icon on their workstations. That’s the OneDrive cloud service. OneDrive is present in every Windows apps: Explorer, Office Suite, and Start Menu. It lets you backup your files and folders, share your favorite pics and movies, organize them to your liking and even edit documents on the go. To access it, just hit the cloud icon, log in with either your Microsoft account or OneDrive account, tell OneDrive what to back up, when to back up, what to store, what not to store, and that’s it. Let’s take a closer look at the OneDrive vs Dropbox debate for business and personal plans. Both Dropbox and OneDrive offer great solutions for businesses, SMEs and corporations. As far as pricing is concerned, OneDrive has two plans: for individual users and SMEs or corporation. Their official web page states there are also three distinct business plans: the personal plan, which offers 1 TB for one user for $69.99/year. The second plan – OneDrive for Business costs $120 per year, and you get unlimited OneDrive cloud storage. As for the third plan, the Office 365 Business Premium, it costs $150/user/year, and it offers 1TB OneDrive storage plus powerful apps from Office. There’s also a smaller personal plan, which costs $1.99 per month and offers 50GB cloud storage space. Another great thing about Dropbox is its pricing system. In order to keep it easy, Dropbox offers two types of plans: one designed for individual users, with good bargains per services and another one suitable for SMEs or corporations. Upon subscribing, the user will receive 2 GB of free storage space and can download the desktop application for free. According to Dropbox’s pricing section, the Business package costs $15 per month for each user. And you’ll need at least five registered users to opt for this plan. As far as business solutions are concerned in the Dropbox vs OneDrive battle, OneDrive clearly has an edge over Dropbox. OneDrive pricing plans are affordable and support all kinds of different payments. You can also mix and match different cloud storage business plans with OneDrive. Security is also one of Dropbox’s strongest features because it employs multiple security protocols: VPN encryption with SSL/TSL, two-step verification process, 256-bit AES encryption for documents, fully integrated with most SAML providers. Furthermore, even though Dropbox is compatible with most corporate firewalls, the program cannot be placed outside the firewall. Security is also one of Microsoft’s major concerns. That’s why the tech company launched Sookasa, an all-in-one security tool that prevents malicious attacks and data theft. Regarding the Dropbox vs OneDrive security battle, the crown goes to Dropbox, which employs multiple security protocols to prevent malicious attacks or data theft. The Sookasa all-in-one tool developed by Microsoft might be easy to use, but it has its vulnerabilities. In fact, there are less reported malicious attacks on Dropbox vs OneDrive. The business plan offered by Dropbox includes unlimited storage allotment. Dropbox also offers Office 365 integration, remote wipe features, password-protected links. In addition, you gain access to admin tools, collaboration tools for real-time editing. Dropbox also features integration with third-party apps and providers. OneDrive for business features the following tools: licensed Office 365, advanced sync, powerful search engine, collaboration tools, file management tools, mobile apps, auditing tools, data loss prevention plan, 24/7 technical support, enhanced security, and file editing on the go thanks to Web Office. For speed, you will definitely achieve better results working with Dropbox vs OneDrive. The average time required to upload a 10 MB folder with Dropbox was 17 seconds using the desktop application. When using the website, it was 30 seconds. For a 10 MB files, the average download time was estimated at 12 seconds. Compared to Dropbox, OneDrive is like the proverbial turtle riding with an anvil on its back. The average upload time for a 10 MB file was 42 seconds using the desktop app and 33 seconds using the website. The average download time has been estimated at 24 seconds. Here you will find a rundown of the most important pros and cons in the OneDrive vs Dropbox competition for each service. OneDrive is a feature that you can access directly from your desktop without the need to access the official web page. So, one of its bigs pluses is its integration. Cloud archiving for camera roll is also available with OneDrive, as well as an advanced file management feature. Furthermore, Microsoft is working on a way to extend the file management and syncing service even more. They want to implement an AI capable of saving pics and video in the file according to their importance. OneDrive is compatible with most major platforms including Windows, Mac, iOS, Android, and Chromium. Regarding storage allotment, OneDrive offers the largest free storage out there: 5 GB upon subscription. Microsoft has been striving to develop a true all-in-one cloud storage service that offers customers both flexibility and ease of access. Currently, apart from the basic cloud functions, you can instruct the application about how to store your documents and media files. As far as integrated cloud storage services go, we can state that Dropbox excels when it comes to OS integration. When taking a first look at Dropbox’s interface, one would mistake it for a common Windows function. With the Collaboration tool, you can view all the changes made to that specifical document in a specific timeframe. Alternately, you can also download a copy of the original document or make changes of your own. As far as compatibility is concerned, Dropbox can be used on most major platforms like Android, Window, iOS, Mac, Kindle Fire and Linux. Although integration is one of Dropbox’s stronger features, it does not offer the same degree of freedom as its opponent, OneDrive. OneDrive vs Dropbox – who will receive the standing ovations? Clearly, Dropbox managed to beat OneDrive when it comes to security and average upload and download speed. However, not even the great Dropbox can compete against OneDrive’s deal-breaking prices. Thank you for reading, and don’t forget to share your thoughts on our Dropbox vs OneDrive comparison in the comment form below.